Selene G. Parekh, MD, MBA, recently operated on a 63 year-old woman with gradual onset left forefoot pain unrelated to any traumatic injury. The symptoms had worsened over the course of 3 months and were more intense with activity. 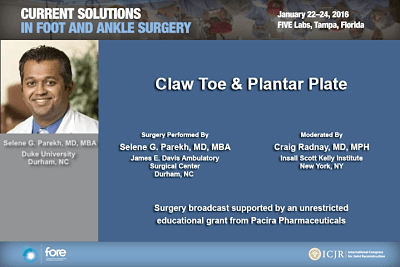 The procedure was broadcast live from Dr. Parekh’s operating room at Duke University Hospital in Durham, North Carolina, to attendees at the Current Solutions in Foot and Ankle Surgery meeting. When the patient first consulted Dr. Parekh, she had already failed a course of conservative treatment. On examination, Dr. Parekh noted exquisite pain over the plantar surface of the second MTP joint. The patient had bilateral hallux valgus and mild subluxation of the second MTP joint on the left foot. The patient’s pain was more pronounced on the lateral aspect of the joint, consistent with a partial plantar plate tear. Dr. Parekh recommended surgery, to which the patient agreed. Click the image above to watch the surgery. Next articleIs There Value in a Customized UKA Implant?